If the Oklahoma Court of Criminal Appeals holds fast to an unpublished decision handed down May 27, 2015, people in Oklahoma might enjoy slightly better protection against aggressive police tactics. The case involved evidence seized during an impromptu police search conducted after officers pulled their patrol vehicle in front of a man walking along a city sidewalk. Based on the search, prosecutors charged the man with possession of methamphetamine. The man consented to the search, but only after he had been nominally detained by police. A Carter County district judge suppressed the evidence because it resulted from an unreasonable search and seizure. The State appealed. At question was whether the search was consensual. Citing a U.S. Supreme Court case Florida v. Royer, 460 U.S. 491 (1983), the appellate judges said it was the State’s burden to show “clear and convincing” proof that the search was consensual. If the search occurred after the man had been illegally seized by police, his consent would need to be sufficiently voluntary “to purge the primary taint of the unlawful invasion,” the court wrote. In essence, police forced the man to choose between stopping for a chat or acting suspiciously, which could have provided them a reason to force him to stop. In this case, the court sided with a constitutional protection against unreasonable searches and seizures. One might hope a similar case in the future might end the same way, but we can never be so certain. As with many cases favorable to the defense, the Oklahoma Court of Criminal Appeals returned the decision as an unpublished case, which lacks the weight of precedent in future cases. The court has at times returned different decisions as published precedent in subsequent cases. Our recent observation is that the published decisions more often favor the prosecution. The recent Oklahoma case highlights advice criminal defense attorneys often offer to those approached by police. Whenever stopped by police, ask if you are free to go. If police ask you to consent to a search, politely decline. Say you do not consent to any searches. Now, we do not advise you to resist a police officer’s attempt to pat you down or search for weapons. If you run away before police order you to stop, in some places your actions can be construed as suspicious. If police order you to stop walking or to stop running, stop. While you can not actively resist a police stop or search, it is important to be able to show a court whether you voluntarily consented. Let’s review some of the basics. Police never need an excuse to talk with you and ask questions, if you are willing to stop, listen and answer. The Oklahoma court cited U.S. v. Drayton, 536 U.S. 194 (2012). In those circumstances, you are free to go. If you are unsure, you can ask if you are free to go. A police officer with reasonable suspicion that you might be involved in a crime – whether it is jaywalking or murder – can briefly detain you, even if only to resolve ambiguity about your actions. It is commonly know as a Terry stop, in reference to Terry v. Ohio 392 U.S. 1 (1968) which laid the groundwork for most stop-and-frisk police work in our time. During a Terry stop, an officer may pat down a person for weapons that might put the officer at risk. Subsequent courts have constructed a notion of “plain touch” that allows them to investigate suspected contraband discovered during pat downs ostensibly conducted to find weapons. The plain touch doctrine established in Minnesota v Dickerson 508 U.S. 366 (1993) extended previous plain view decisions. In Coolidge v. New Hampshire 403 U.S. 443 (1971), the court said items seen in plain view during otherwise permissible police activities could be seized if it is immediately apparent that an unseen item felt during a pat down search is contraband. The plain touch rule allows police to feel the outside of a person’s clothing then dig further when they claim some lump probably feels to them like concealed drugs. In such circumstance, the standard rises from reasonable suspicion for a Terry stop, to something akin to probable cause that justifies seizure of an unseen item. Different Constitution in High Crime Areas? What comprises reasonable suspicion for a Terry stop? That can vary depending on the neighborhood. 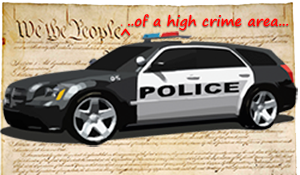 In Illinois v. Wardlow, 528 US 119 (2000) the U.S. Supreme Court determined running from police in a “high crime” area could provide reasonable suspicion for a Terry stop. Courts have not provided any objective basis for what comprises a high crime area. The combination of cases has inspired a litany police recite from the witness stand to justify impromptu searches, in case after case, contriving endless variations on a familiar theme. A person was stopped because their slightly furtive action in an ambiguously defined “high crime area” created reasonable suspicion. “For officer safety” police pat down the person — ostensibly checking for weapons. Their pat-down search reveals lumps or containers officers conclude are probably drug related. With probable cause to believe the ambiguous lumps are contraband — based on their “experience and training” — officers then proceeded with an unwarranted search. Police often ask people if they will answer few questions in what might or might not be a voluntary encounter. Few who know how police work would say it is routine for police to remind people they do not have to answer and they are free to walk away. A nationwide practice of forcibly stopping people in low income neighborhoods in the thinnest of pretexts could certainly make a reasonable person feel they are not free to leave when police ask them to stop for a chat. Police routinely escalate tactics when people in those circumstances refuse to comply. Regardless what precedent says, police might infer reasonable suspicion from a person’s unwillingness to consent when police request that they stop for a chat. The average person might not appreciate the nuanced difference between a request or an order from a burly officer equipped with a sidearm, handcuffs, chemical spray and baton. The Oklahoma Court of Criminal Appeals turned to Royer Court’s consent to search doctrine for guidance in deciding whether a person freely consented to a search. In that case, the court determined that a police request that a man go into a small room in an airport while they held his airline ticket and drivers license – without explaining that he was free to go – was even beyond the scope of a valid Terry stop. Royer and a similar case, Florida v. Bostick 201 US 429 (1991), frequently appear in arguments over whether refusal to consent to a search can provide reasonable suspicion to conduct a warrantless search. The U.S. Court of Appeals, 10th Circuit, cited Bostick in 1997, stating “we emphasize that refusal to consent should not have been considered in determining reasonable suspicion.” U.S. v Hunnicutt, 97-5087. Likewise, what comprises a “show of authority” sufficient to imply a person has been seized against their will might be better spelled out in future cases. In California v. Hodari, 499 U.S. 621, (1991) the Supreme Court said Fourth Amendment “seizure” begins with the application of even slight physical force, or a “show of authority” that restrains a person’s movement. Whether a person believes they are being detained can influence their decision to consent to a search. A person who believes they are in police custody might consent to a search because they think they have no choice. The question might seem more like an offer of “the easy way or the hard way” to undergo a search the person cannot otherwise refuse. When a violent suspect is afoot in the neighborhood, it might be prudent to assist police in their investigation. But any time a person might be the subject of a police investigation, it is usually best to refuse consent to a search and to establish that a person is being held against their will if that is the nature of the stop. Even if you have nominally consented to a police search and been charged with a crime, the search might be an illegal search and seizure in Oklahoma. For a free consultation with a criminal defense attorney in Tulsa, call Wirth Law Office at (918) 861-1681 or send your question using the form on this page.